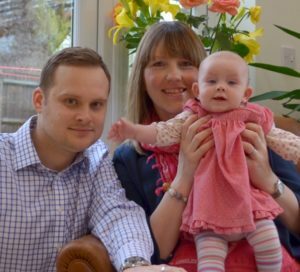 Having a fertility test at Bourn Hall Clinic in Cambridge was one of the best things Bedfordshire couple Rebecca and Robert Tear have ever done. The test revealed the cause of their infertility and now the couple are proud parents to IVF baby Amelie. Most people don’t know they have a fertility issue until they try to conceive and even then it can be several years before they can be referred for tests. The fertility test is a series of tests that check the basics such as sperm count and ovulation and also includes more detailed scans to rule out any issues such as blockage in the fallopian tubes or cysts on the ovaries. If the tests reveal anything that may impact fertility the couple is able to make informed choices of what to do next. Dr Thomas Mathews, UK medical director at Bourn Hall Clinic, explains that it can help a couple choose their next steps: “Some timely lifestyle advice may be all that’s needed to help improve someone’s chance of becoming a parent or indeed to start trying for a baby sooner than initially planned might be the answer. For the Tears it gave them the information they required to be referred for fertility treatment. The couple eventually decided to go for a fertility test at Bourn Hall Clinic and this in depth investigation revealed underlying causes for their infertility. Bourn Hall’s Fertility Health + Wellbeing Test can help you find out about your fertility – click here to see more details. If you have a previous medical history that might impact your fertility, it might be that a different combination of tests might be more suitable. Do contact us to talk through your options.